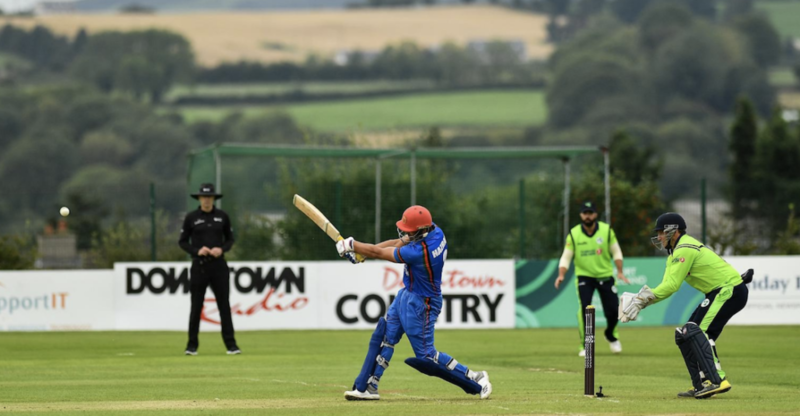 In only his second T20I, Zazai took Ireland’s bowlers to task at the picturesque Bready in Northern Ireland, hammering eight fours and six sixes as he raced to 74 before being caught behind by wicketkeeper-captain Gary Wilson off Simi Singh at the start of the eighth over. Zazai dominated an opening partnership of 87 with Mohammad Shahzad, who scored 29 off 21 balls. Zazai was uncontainable in the fifth over, hitting the first ball from Tyrone Kane over square leg for six, cutting ball three past point and hitting the next ball for six to bring up his fifty off 22 balls. 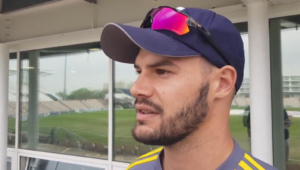 He flat-batted the last ball of the over back past the bowler for six, before adding sixes off the first two balls of the seventh over as he moved to 72 off just 28 balls. Captain Asghar Afghan was bowled by Joshua Little for 31 off 30 balls as Afghanistan ended 160-7 off their 18 overs after a rain-delayed start. Pick of the bowlers was Little, taking 2-20 at an economy rate of 5.00. Fresh from T20 scores of 60, 109, 78 and 58 in the past month for Middlesex in the Vitality Blast, Paul Stirling got the Ireland innings off to a good start with 27 off 19 balls, but two early wickets from Mujeeb Ur Rahman kept the initiative with Afghanistan. Wilson scored 32 (23 balls) after Ireland had been reduced to 55-4, but after Wilson skied a catch to Usman Ghani off Aftab Alam to leave his side on 90-6, the match seemed beyond the home side. Singh (20 off 17) and George Dockrell (22 not out off 13 balls) added a valuable 41 off 28 balls to keep Irish hopes alive, but Singh fell off the last ball of the 17th over, with Ireland still needing 30 to win off the last six balls. Having managed just two boundaries off the previous five overs, Ireland produced one of their most profitable overs, hitting Rashid Khan for three fours, but they also lost two wickets as Afghanistan secured a comfortable 16-run victory. Mujeeb Ur Rahman was miserly with the ball (2-14, econ 4.66), while Alam (2-30) and Khan (3-35) also produced the goods with the ball. The second game in the three-match series will be contested on Wednesday, with Bready playing host once again. Hazratullah Zazai’s half-century off 22 balls was the fastest for Afghanistan in T20Is.